I enjoy mysteries. This has always been my favorite genre no matter what age it is for. In this story, we have three really great characters. Two of them are former nurses during World War I. The third character is their elderly uncle Percy. 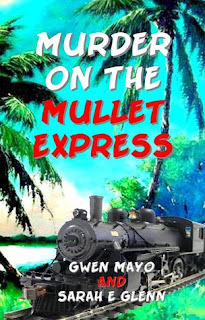 The three of them find themselves on The Mullet Express, when their car breaks down. They are headed to Homosassa Springs. This is a place that is just about an hour and a half north of where I live in Florida. They witness a fight between two men on the train. The problem is that one of them ends up dead shortly after arriving at his hotel. Uncle Percy becomes the prime suspect. Teddy and Cornelia must help find the real killer. After all, Cornelia’s uncle may be a bit crazy, but he is definitely not a murderer. I loved Cornelia because she was a very independent woman for the time. I learned a lot about the time period. I’ve lived in Ocala and I am very familiar with the areas mentioned or alluded to in the book. This is a great mystery with a lot of history and one I would definitely recommend.